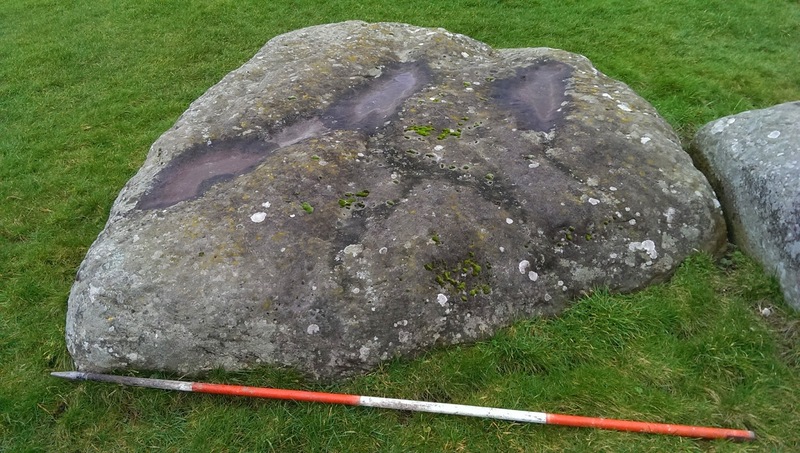 This provided the first evidence (though not conclusive) for the existence of stoneholes, and hence, the stones 17 and 18. 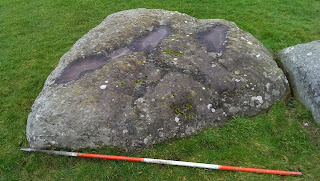 The stoneholes for 20 and 19, as well as other recorded holes, showed up as parchmarks as well. 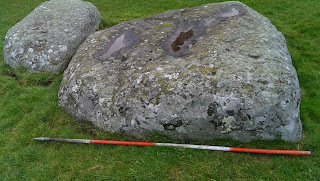 The top of Stone 19 still lies on the ground and I thought it would be interesting to compare it with the parchmark of its stonehole. And it is a fairly good fit for width, though of course the missing part of the stone may have been wider or narrower. The parchmark from the south west. The remains of stone 19 (stone to the right is a fallen lintel) the break would be about half way down the stone, the bottom half is missing. 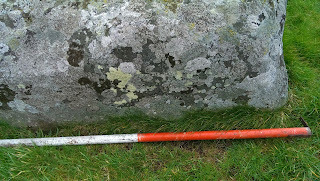 One oft the tenons, much eroded, on the top of stone 19. "Stonehenge Unhinged was an attempt to demonstrate how its builders may have used the Aubrey Circle from the time of the early monument as a calendar for marking the solstices and equinoxes as well as the traditional Celtic holidays. The Temples of Albion An Exploration of the Purpose behind Stone Circles is an effort to put the achievements at Stonehenge into perspective, not as a stand-alone calendar, but as the final act in an ongoing Great Stone Circle Race lasting hundreds of years. In the process, stone circles like Long Meg and Her Daughters, Avebury, the Grey Wethers, Castlerigg, the Hurlers and Swinside are all examined and their connections through time surveyed in such a way that the mystery of why stone circles were built falls before a cascade of connections and coincidence. Suddenly, the problems of the number of stones at various sites, circles of all shapes and sizes and possible astronomical alignments all tumble before a simple, logical progression showing the gradual development of new circle technologies all groping towards the ultimate goal of The Calendar, realized at Stonehenge. Along the way, the capabilities and aspirations of the Neolithic minds behind the circles are examined. The evidence presented reveals these "howling barbarians" were far more capable and astute than currently recognized, pursuing an elusive goal for centuries and transmitting their knowledge, as it accumulated, to future generations. The result is a simple, logical and compelling story of regional competition and dissemination of new ideas, via trade, throughout the British Isles. This is a journey of exploration which, as a result of new ideas, provides unanticipated insights into questions which have puzzled antiquarians and archeologists for centuries. Why were two of the largest circles in Britain built at Avebury? 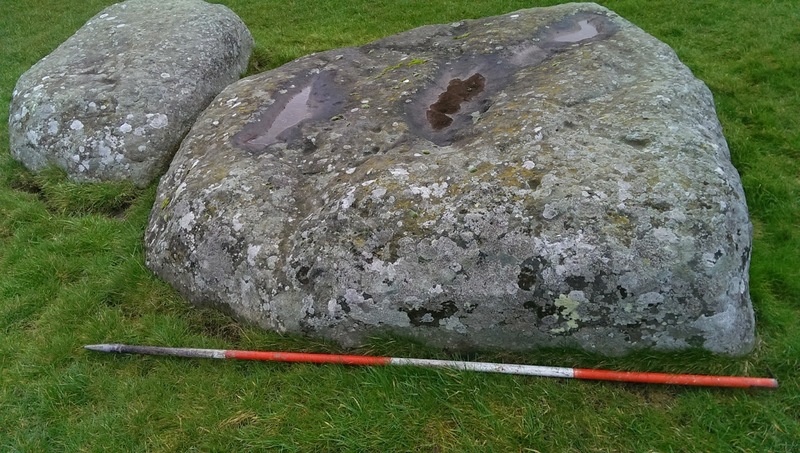 Why does Castlerigg have an enigmatic rectangle of stones in its interior? What is the meaning behind the deformed Celtic Cross which is Callanish? All these mysteries and many more are addressed and, suddenly, are no longer head-scratchers but perfectly sensible and functional expressions of purpose. Anyone who is fascinated by Stonehenge and all the other enigmatic stone circles of Britain will find this enthralling account of circle development not only credible but also an Occam’s razor which slices through the muddle which is our current lack of understanding. 123 Illustrations." I found it fascinating, it is so full of interesting points that I have only managed to skim over the surface, it is something I will go back to and read at leisure. Even if you reject his theory completely it is well worth reading. If, like me, you are not yet a convert then it is an argument that has to be considered. But even ignoring the theory it is a rich read with quotes and background and stories that make it a joy to read. This is an extraordinary follow up to Stonehenge Unhinged The Wheel of the Sun. It provides a tour of stone circles where the author brings his knowledge, and apposite quotes, to both describe the circles but also to argue his theory of their numerical application in the construction of calenders. I'm not completely convinced but am not quite sure why not. Maybe I have read it too quickly when otherwise distracted, maybe I need a printed copy I can scribble in. But I really enjoyed reading it,and will continue to return to it both to absorb the atmosphere of the places he brings to life but also to tease out the argument and further consider it. Anyone interested in Stonehenge and other ancient stone circles should have it on their bookshelf. I discovered this surface scatter in the spoil from animal burrows, the black round object is from a rabbit, last summer. Over two hundred chips were seen on the surface. 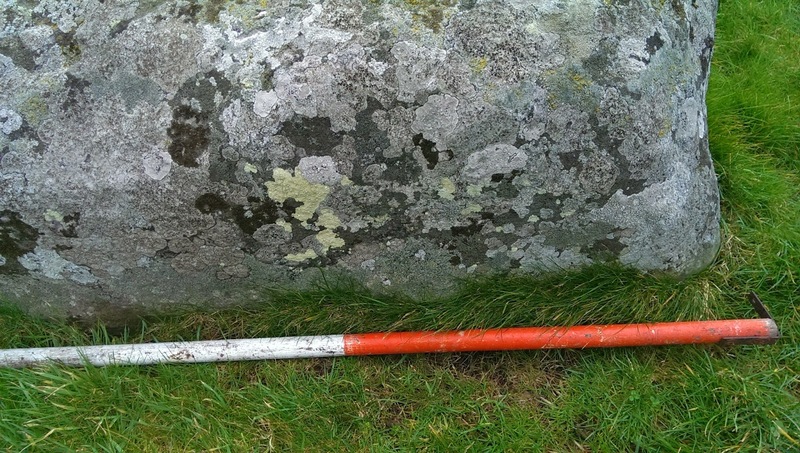 The find was very close to Stonehenge, in the landscape but not within the Stonehenge Triangle. It was on the footpath of the A344 between the tunnel and Heel Stone, which has now been covered over with the restoration of the landscape scheme. Lithics from within the Stonehenge landscape collected by Mr T. Daw. A selection of small lithics were collected by Mr T. Daw from within the Stonehenge landscape, they were macroscopically identified using x20 magnification. Their uniform but very restricted size range is of note as this would be unusual for Stonehenge debitage. They comprise a mixture of modern roadstones, mainly fine-grained basalt , altered basalt and felsite, plus a single Stonehenge saccharoidal sarsen. The majority of the lithics are fine-grained igneous and similar in appearance to the spotted dolerites comprising most of the bluestones. 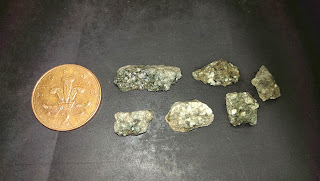 Although the lithics are too small to determine macroscopically they appear to include two different types. No non-dolerite bluestone (rhyolite, tuff/ashes, sandstone) was recognised. Two representative samples were sectioned to determine if either main group of lithics was a Stonehenge bluestone but neither was. A sample of the abundant white feldspar and one of the rare, white feldspar classes of possible preselite were sectioned and petrographically described in transmitted and reflected light. Neither thin section showed Preseli Dolerite. The abundant white feldspar is an altered feldspathic rock possibly a basalt and the rare white feldspar rock is an altered felsite and more acidic carrying primary quartz. 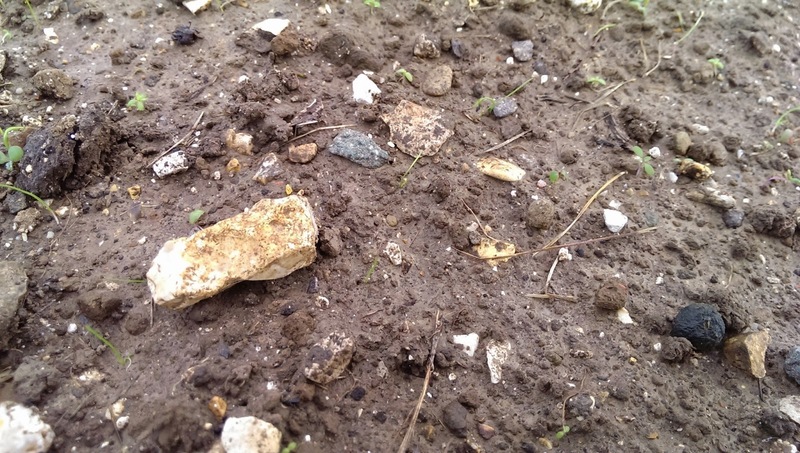 The two sections add to the large number of adventitious lithics-mainly 19th and 20th century roadstones found in the Stonehenge Landscape. 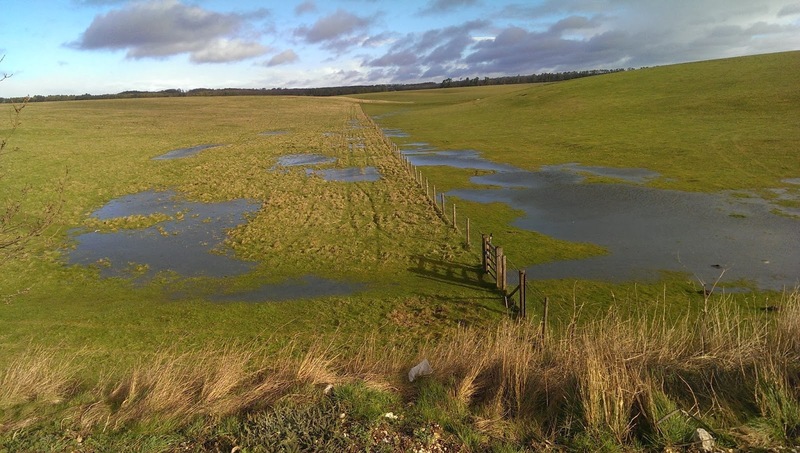 Initial results from the English Heritage survey work in the Vale of Pewsey and which are informing a fieldwork project being undertaken over the next few months. Very interesting. I have covered the Marden area a few times on the blog. Here are some links to some of the posts. The first two are the most relevant I think. This is the magazine version of Research News. It reports on projects being undertaken to support the National Heritage Protection Plan, whether commissioned from, or jointly funded with, external partners or undertaken directly by our own expert staff. The water table has risen so high that Stonehenge Bottom is now holding water - a winterbourne that I haven't seen before. I think something should be done to restore the correct view. Once upon a time, the military took account of the importance of the view of solstice sunrise from Stonehenge. When - in 1910 - the British and Colonial Aeroplane Company gained permission to establish their flying school alongside the Army's aerodrome on Larkhill they were compelled to build their hangars so as to leave a gap for the summer solstice sunrise to shine down to Stonehenge. 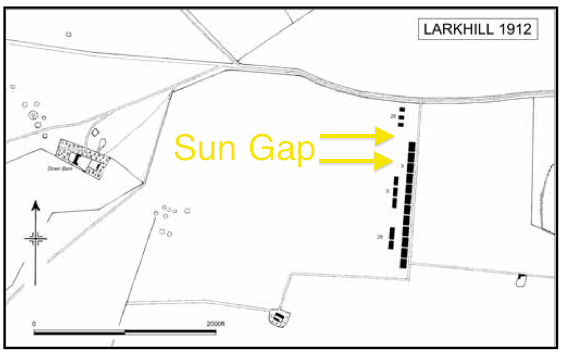 This became known as the "Sun Gap"
This report describes geophysical exploration of Stonehenge and the triangle of land that encloses it (the 'Stonehenge Triangle') undertaken in 1993-4 by the Ancient Monuments Laboratory. 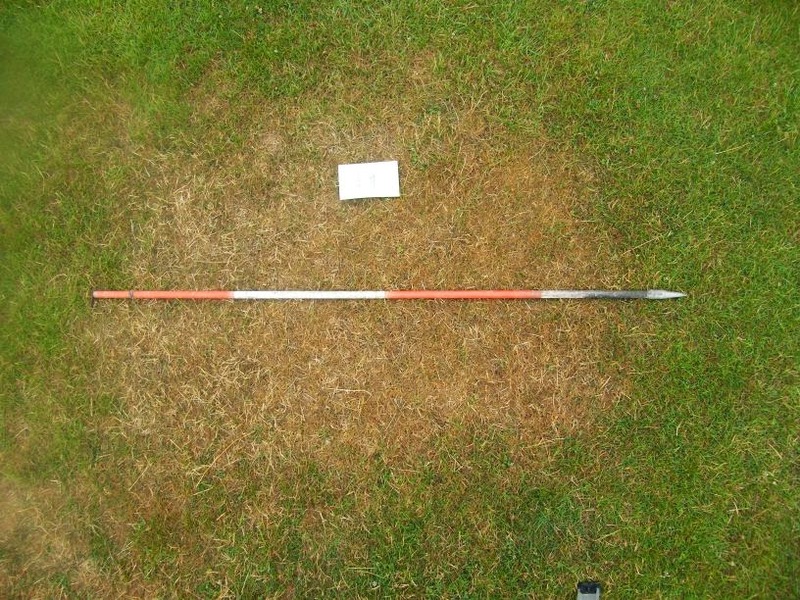 The surveys were carried out on behalf of English Heritage and Wessex Archaeology for the Twentieth Century Excavations at Stonehenge Project and consisted of a magnetometer survey of the whole triangle and a detailed resistivity survey of the famous henge monument. The magnetometer results provide new information on monuments and features in the triangle, some already documented but not previously subject to detailed study or survey. 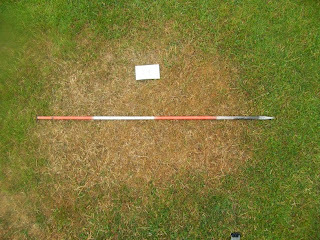 The resistivity data enhances the existing body of excavation and survey evidence for the arrangement and structure of the henge monument in its various phases. 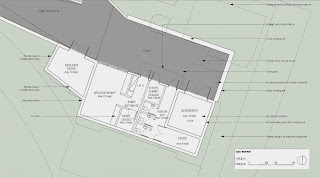 Both surveys therefore make a significant contribution to further understanding the history of an area at the heart of a landscape of outstanding archaeological importance. 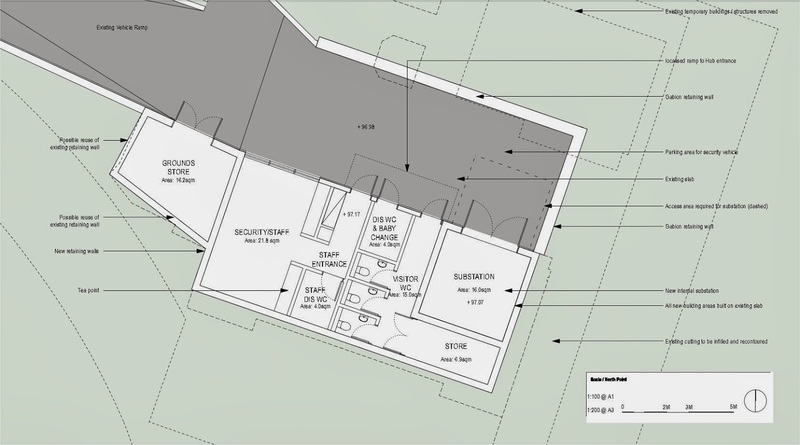 The old visitor centre is being demolished and this is the hub building that will be erected in its place. Stonehenge - The Stone Hanger?